Not only will the people of Skeheenarinky be shouting for Tipperary on Sunday in the Munster Senior Hurling Championship Semi-Final against Limerick in the Gaelic Grounds in Limerick, we’ll be shouting for our own Darragh Brennan – Son of Helen Brennan (Fox) and Paul Brennan from the Blackroad. Darragh is playing in the Primary Games A Team representing Skeheenarinky National School at half time. Best of luck Darragh we are all very proud of you. Photo from Shannon Airport -Sponsors of the Primary Games. There was Skeheen’ people who have waited a lifetime to see it, and no better representative for those who thought they might never see this day, than proud Skeheen’ captain John Martin to raise aloft the first ever Junior A County trophy to resounding cheers from the delighted supporters. A day when skill and passion combined to produce a gripping encounter but thankfully see Skeheenarinky emerge as victors and a place in a Munster quarter final to contend with this Sunday. 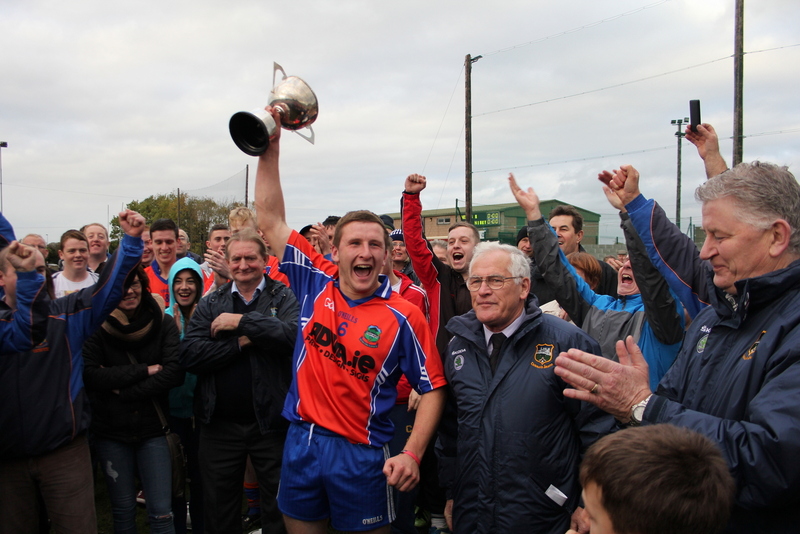 Proud Skeheenarinky captain John Martin raises aloft the County Junior hurling Championship trophy. This is the first time in the clubs history to secure the title so a truly memorable day for all who witnessed it. A Muster quarter final awaits this Sunday. The path to the final saw us beat Thurles sars in the County quarter final on a 1-18 to a 3-10 scoreline and Kildangan from north Tipp in the semi final on a 1-15 to 0-16 scoreline. So after two great victories where we came back from being four and five points down and scoring an injury time winning goal against Kildangan, it was no surprise to see a large number of supporters displaying the blue and orange travelling to Cashel last Saturday where a thrilling and nerve wracking match lay in store. With Nenagh winning the coin toss they would choose to play against the very strong wind in the first half and within twenty seconds would be on the scoreboard with a point from play. Our first score came in the third minute when Paudi Fitzgerald intercepts a sideline cut and passes neatly to Conor Sweeney who would swing over his shoulder and split the posts. A minute later Nenagh would win their own puckout and score a point from play. Paudi yet again anticipates a poor sideline cut in the fifth minute and passes to the oncoming Tommy Sweeney who made no mistake in pointing. The next two points would be Nenaghs, the first a free and the second from play after Neil Barret and John O’Callaghan almost combined for a perfect score but the handpass would be a fraction high, no fault of either and reminiscent of Lar’s pass in this years all Ireland. What could have easily been a Skeheen’ score sees the sliothair cleared up the field, and breaking kindly for the Nenagh no. 10 he finished expertly to the net. But a great response from Skeheen’ as from the ensuing puckout, Jason Cahill in goal would pick out Noel Vaughan who taking on the defence in his trademark style, would make the space to take his point. The score now 1-3 to 0-3. Conor Sweeney would strike the next two points, the first from a free he won himself and the second from play. Nenagh were exerting pressure on our goalmouth at this stage, with Jason scooping out a shot over the endline. The resulting 65’ would drop short but is cleared out of danger with Eoin Kearney quickest to react. In the fifteenth minute John Martin would rise highest and pick the ball from the sky, then send a pass from the hurl to Seamus O’Callaghan who points in his stride. A minute later it would be Riain O’Callaghan clearing his lines who would pick out Seamus again, this time Nenagh sense the danger he poses and push him to the ground, Conor Sweeney points the resulting free. In the Eighteenth minute we would trade frees, the first for Nenagh after a harsh decicion on our backs and the second when yet again, Seamus O’Callaghan is fouled, chopped down this time running at the Nenagh goal, and Fionnan steps up and points this free. This would see us creep a point ahead and whilst Noel Vaughan would see the umpire raise the white flag in the 21st minute, the sideline official would over-rule it as a wide ball, and no hawkeye yet in Cashel to prove him wrong! The next five minutes or so would see a period of ferocious hooking, blocking and and full on commitment from both teams with neither breaking the deadlock untill Fionnan O’Sullivan would point from play in the 26th minute and would add another pointed free to his tally in the 28th minute. This free was the result of yet another foul on the tenacious Seamus O’Callagahan who was a major cause of problems for the Nenagh defence. The final minutes of the first half would see us exerting good pressure on the Nenagh backline but with no reward, but still leaving us a vital three points ahead at the interval having played with the wind, the score 0-10 to 1-04. This meant we had held Nenagh to five scores in the first half and they had gone without a score in the final fourteen minutes of the half, so the omens were good but alot of hurling still to do and against the wind. Nenagh had it back to a one point deficit within three minutes of the restart with a free and a point from play despite great defensive work from the Skeheen’ backline. In the 34th minute Skeheen’ would receive a huge confidence boost with some fantastic hurling skills on display. Starting with a terrific catch from John Martin, with Conor Sweeney in support passing on to Tommy Sweeney, who in turn lays off a handpass to Noel Vaughan who rattles the net for the second game in succession. Nenagh point a free in the 35th minute followed by a Fionnan free after who else but Seamus O’Callaghan is fouled again. At this stage the Nenagh goalie was getting tremendous distance on his puckouts with the aid of the breeze and keeping the pressure on the Skeheen defence. Riain O’Callaghan typified the spirit being shown when in the 38th minute he burst out of the half back line and passes to Noel Vaughan who is fouled and Fionnan calmly points the free. A Nenagh free in the 40th minute is pointed but Conner Sweeney soon cancels this out with a point from play a minute later. This would leave us five points to the good but Nenagh would then threaten to break the lines with two attempts on goal. Jason saves the first but Nenagh secure the break and score a cracker of a point and then Jason and Shane Molan stop a certain goal but are forced to parry the shot over the endline for a 65’ which is also pointed. The next five minutes would see Nenagh hit three wides in quick succession before scoring a point from play in the 49th minute leaving the score 1-13 to Skeheen’, 1-11 to Nenagh… a dangerous lead. Six nervous minutes would pass before an Eoin Morrissey hook sees the ball find its way to Noel Vaughan who is fouled whilst on a mazey run through the defence. Fionnan scores the free and that would be Skeheen’s last score of the match, although our forwards were creating lots of chances and working hard for possession. With Paudie fitzgerald acting as provider, Darragh Lyons and Noel Vaughan were unlucky not to get a goal each but the Nenagh goalie was on top form. As the clock ticked into injury time the tension was ratcheted up with balls raining down on our full backs. Davy Hyland would rise majestically to avert the danger in the 62nd minute but in the ensuing melee for possession Nenagh would win close a range free. With their goalie called in to try and send this game to a replay, he would blast the ball just over. Nenagh would get one more chance to upset the cardiac rhythms of the Skeheen’ supporters but Davy Hyland again would clear the lines and his would be the last touch of the game. The referees full time whistle saw the players engulfed by delighted Skeheen’ supporters and nobody was in a rush to leave the field…this moment was to be savoured. If there was to be a decision for man of the match it would be a debate that would have to be abandoned for no one man could take the prize such was the completeness of this Skeheen’ performance. Every man on the Skeheen’ side fulfilled the task assigned to him and then some. We send our congratulations to all the team and panel who have all played a part in this achievement and also to the management team and all those who have worked with these teams at juvenile and underage levels for the past number of years. Without your efforts we would not have arrived at this day. Team and Scores: Jason Cahill, Shane Molan, Eoin Kearney, Dave Hyland, John O’Callaghan, John Martin(Captain), Riain O’Callaghan, Fionnan O’Sullivan(0-5 frees,0-2 play), Paudie Fitzgerald, Seamus O’Callaghan(0-1), Conor Sweeney(0-3 frees,0-1 play), Eoin Morrissey, Neil Barrett, Noel Vaughan(1-1), Tommy Sweeney(0-1) Darragh Lyons Extended panel: William English, Anthony Crotty, Mikey Sweeney, Tom Martin, John Ryan, Ceallach Hennessey, Shane Lynch, Brendan English, Cian Duggan, Darragh O’Sullivan. 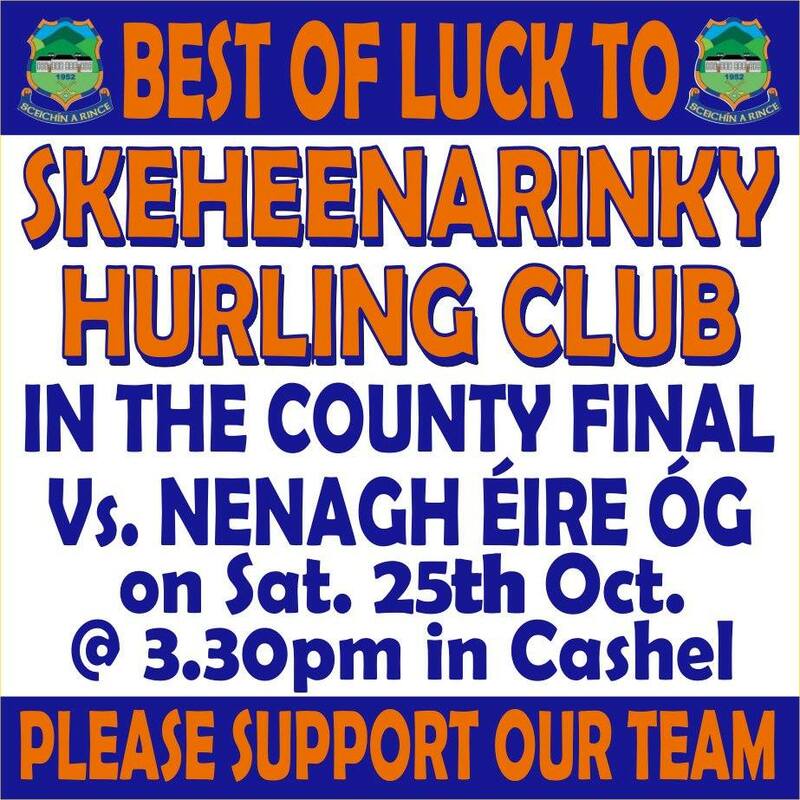 Skeheenarinky Junior A hurlers will be hoping they can make history this Saturday October 25th in Leahy park, Cashel when they will play Nenagh Eire Og in this years County final at 3.30pm. Anticipation is growing ahead of this fixture that a long overdue County final victory is now within touching distance for the parish of Skeheenarinky and Ballyporeen who have never won a hurling County title at this grade. Our last County final appearance was fifteen years ago when we succumbed to Galtee Rovers in the 1999 final, which goes to show opportunities like this do not come around too often. The whole parish are really willing this team to play to their full potential on Saturday and put their names in the history books. This Skeheen’ side are a young team full of hurling and have come up through the ranks together winning many titles at underage level including back to back South Championships in the minor and U21 grades in the past few years. Many names on this Skeheen’ side would be familiar to Tipperary supporters of both codes with players such as John Martin (All Ireland minor football winner), Eoin Kearney, Conor Sweeney (Tipp senior footballer),and Fionnan O’Sullivan (Tipp minor hurler) having worn the blue and gold over the past few years. This part of Tipperary may be looked on as a predominantly footballing area and with many of this same Skeheen’ side having won the County Intermediate football Championship last year with Ballyporeen, the step up to Senior football has been a major boost to the parish. But these players have always had a love of hurling and they have all the skills to prove it, so hopefully Saturday next will be the culmination of many years of hard work and see this Skeheen’ side finally bring a Junior A hurling County title to the parish. The path to the final saw Skeheen’ overturn a six point deficit in the quarter-final against Thurles Sars and a five point deficit against Kildangan in the semi-final to earn their place in the final, so we know this side have a fighting spirit which we hope to see in abundance next Saturday. We urge our supporters to come out in force and show your appreciation for the team and the work they have put in to get to the final and hopefully see history in the making. To manager Declan Hickey, selectors Eamon Maher, Johnny Bourke, Fergal McLoughlin, Joe English and Conor O’Farrell a special word of thanks for the tremendous work they have put in all year and we wish them and all the team the very best of luck on Saturday. On Thursday last, June 7th, the Skeheenarinky School hurling team and a large number of supporters travelled to Semple Stadium to play Mount Bruis in the finals of the primary school 7 a-side games played at the famous field. 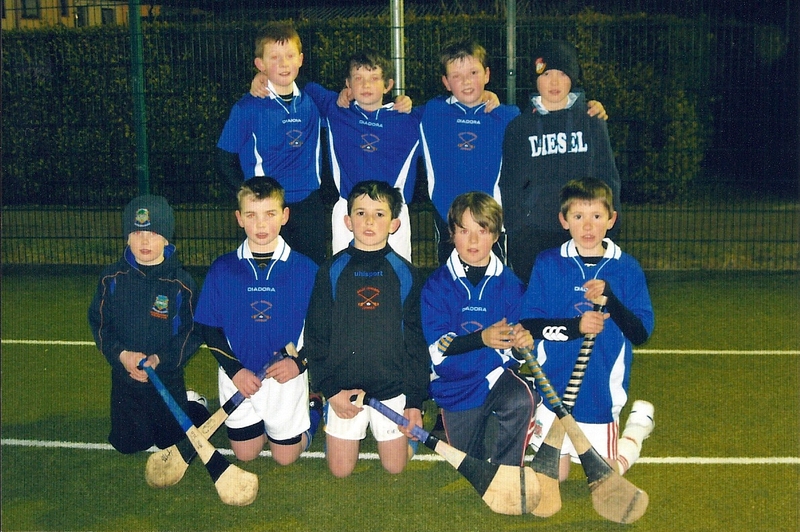 Those are the days on which young players see their dreams fulfilled – to play on County Final day. It was indeed wonderful to see the young Skeheenarinky players in their blue and gold colours running on to the field. The day was wet and windy but thankfully the rain held off during the game. Playing against the breeze in the first half, our backs came under pressure early on with the opposition shooting a number of wides and our own goalie in action quite often. The team settled and scored first with two points. Playing an extra back helped in a big way to leave the score 2-4 to 0-2 in our favour at the break. Having to play by rule, a sub was introduced in the first half. A point early in the second half increased the lead. Mount Bruis school-boys never gave up and contested every ball with great determination and, with a bit of luck, could have added a few more scores. Two subs came on and played their part. Two more goals near the end left the score 5-9 to 0-4 at the finish. Again, the opposition were not a bad team; they had some fine hurlers but the skill and team-work of our own players proved too much for them on the day. At the final whistle, all the school pupils, teachers, parents and supporters rushed onto the field to greet the players. It was indeed a historic occasion for all concerned. The trophy was presented to the team captain, Tomás Vaughan, who thanked everyone who came in support. A ‘player of the match’ from both sides was selected with our captain representing Skeheenarinky. Today, the Skeheenarinky blue and orange colours were in show to welcome the All-Ireland-winning Tipperary hurling captain, Eoin Kelly, along with the Liam McCarthy cup to the school. Pictures from today can be found in the photo gallery. 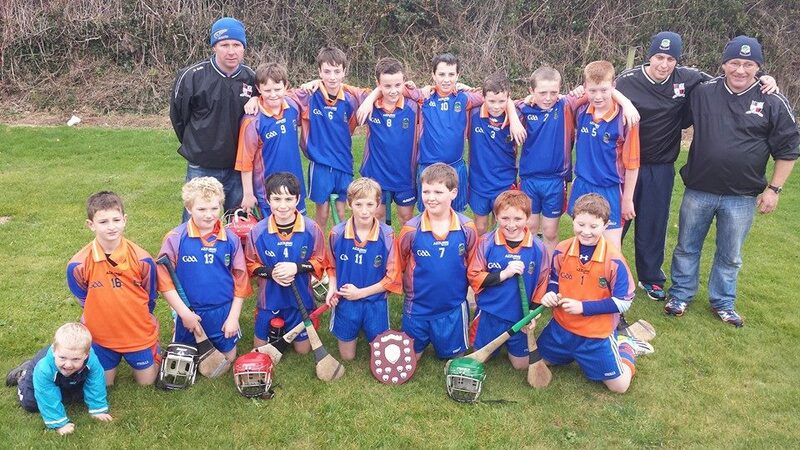 The Skeheenarinky Under-11 Hurling team came out on top at the Newcastle 7-a-side tournament on Thursday night, 11 March. 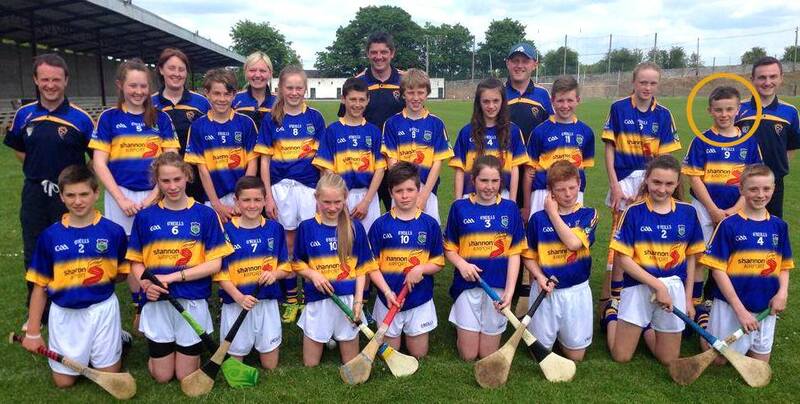 In the final, they beat Clerihan, 6 goals to 2. In the picture above are Darren Dwyer, Fionn McLoughlin, Aidan Donovan, Josh Macken, Darren and Oisin Brennan, Thomas Vaughan, Riain Hennessey & Kieran Macken. Missing from the picture is Jack Donovan. The club is holding its A.G.M. in Ballyporeen dressing rooms at 8:00pm next Saturday night, December 12th. A good turnout is expected on the night. The club will be launching their new merchandise on Saturday, December 19, in Ballyporeen Hall at 8:00pm. 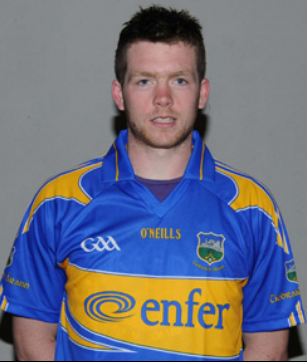 Tipperary Hurling All-Star Paudie Maher will formally launch the gear on the night and he will be there to sign your new club gear, chat and maybe a few photos also. We are currently taking orders as there is limited stock – so don’t leave it too late or you may be disappointed. The gear is of our own unique design of navy blue and royal blue with orange trimmings. Our club’s crest/logo will also feature and they are a must have for Christmas and the New Year! Refreshments will be served on the night, special offers can be found, and a free draw will also be held for everyone present. Adult gear is available in 3 sizes (small/medium/large). You can book your gear from Ger Fox on 0872441678 and it will be available for collection on the launch night. We are holding our now annual Poc Fada on St. Stephen’s day. This is always a good way to work off the Christmas turkey and ham and a way of working up a thirst for the night ahead! We hope to get started at 1:00pm sharp, as last year the last group failed to finish due to darkness. The cost is €10 per person or €30 per team. All proceeds are for The South Tipperary Hospice and a good turnout would be appreciated.